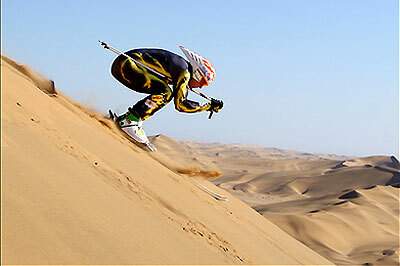 Since the 31st May 2010 Namibia is now a part of ski history with a sand skiing record. 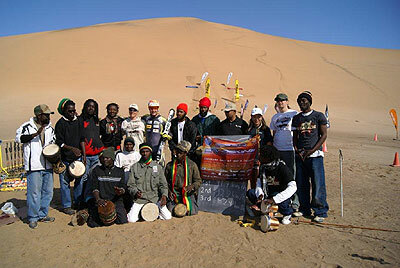 The Namib Desert is already in the Guinness Book, because it is the oldest Desert in the world. 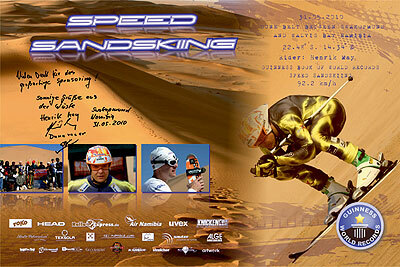 Now has the oldest desert the fastest sand skier in the world. 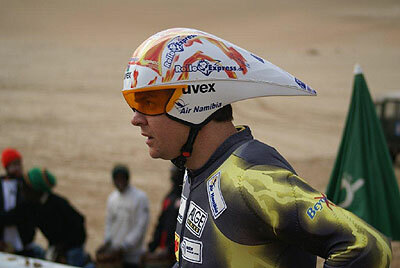 Henrik May was born 1975 in Suhl (Thuringia Forest) in Germany and lives since 1998 in Namibia. 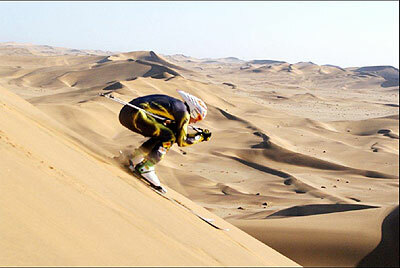 In 2002 he started dune skiing, and he also do research to create a sand ski, a sand sledge and also special cloth for these kinds of sport in the desert. For the record he had one hour time according to the regulations given by Guinness. 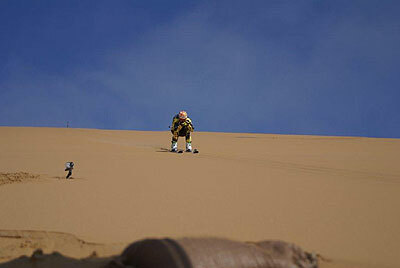 He was able to do three downhill runs, and he always did climb up the dune without any vehicle or help to make sure that the sensitive environment of the dune does not get destroyed. 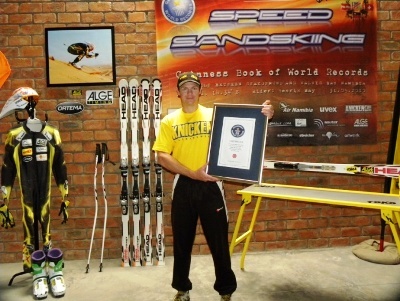 For the record he used ski equipment of his choice which was given to him by HEAD Austria, he used wax from Swix-Toko, and Alge Timing Austria did send him the time measurement equipment. Three experts from Europe were also there to make sure that all the Guinness Book regulations were complied to. Eliane Sauter from Liechtenstein was responsible for the correct measurement, Bruno Winkler from Switzerland was one of the witnesses and Michael Knauth from Artwork Germany was the Promotion Manager and he also brought a special cyclist helmet for the race which was given from Uvex. 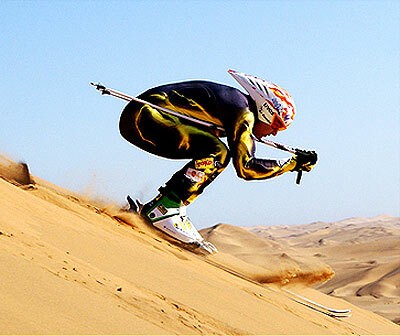 All material used for the record needed to be allowable under all FIS competition regulations and the companies had to certify the equipment which was given for the record. 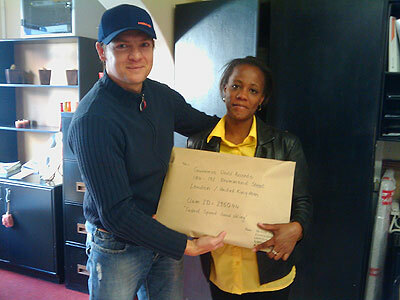 The dune had to be surveyed and the owner of the land which was in this case Namibia had to write a permission. A static camera must be focused on the attempt at all times. 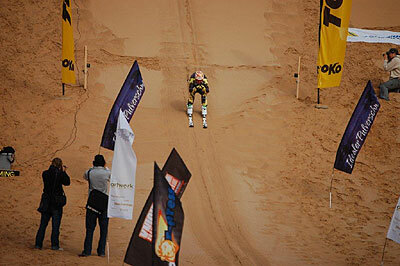 The second attempt was the fastest with a speed of 92,12 km/h (57,24 mph). The day was perfect for the record. It was a sunny day without wind. Henrik’s friend Raymond which is one of the best Sandboarders in the World came with some of his african friends and they did support Henrik with their african drums. 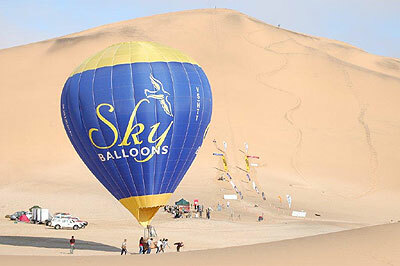 The atmosphere was very exciting when for the third attempt a hot balloon from African Adventure Ballooning did cross the dune. 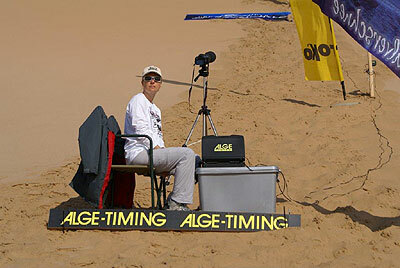 A 75,11 m high dune with an angle of 29 degrees was the setting in the dune belt between Swakopmund and Walvisbay. 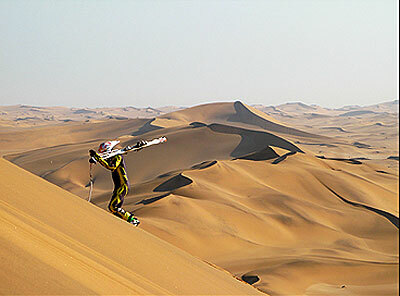 Henrik had a run up distance of 105,57 m and then the speed was measured. 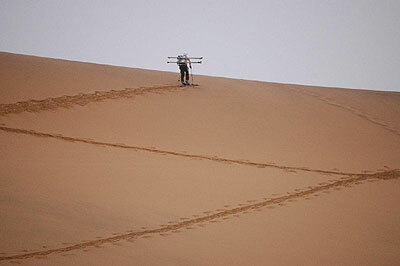 The record run shows clearly that the speed of skiing in sand is not far away from skiing in snow, and with a special produced sand ski will skiing in sand be quiet easy for interested people in any desert or dune in the world. Now the certificate is proudly displayed in his shop, and a copy thereof was given to the Mayor of Swakopmund Mrs. Germina Shitaleni. 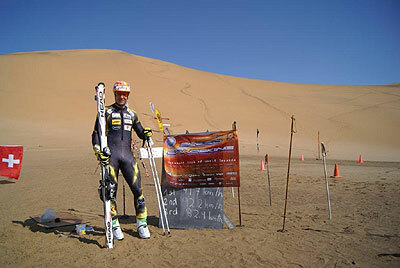 Henrik also gave her a pair of Germina skis which is a ski production company in Thuringia were he comes from. The Mayor was very grateful and proud that a local citizen had done so much and has gone to such an extend to promote Swakopmund internationally. 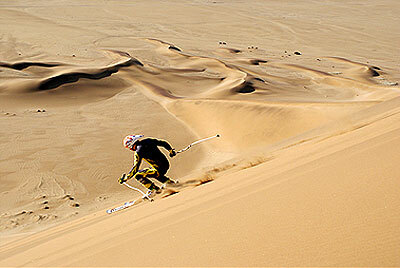 People often ask me how it came that I moved to Namibia, how I get the Idea to ski on sand and how it came that I did ski races in Switzerland for Namibia says Henrik. That is why I wrote my autobiography which will be printed soon in German first (Des Glückes eigener Schmied – oder von einem der Auszog die Freiheit zu finden) and later it will be also translated in other languages.